Here is what's new this week in To Your Health, a consumer health-oriented podcast from NLM, that helps you use MedlinePlus to follow up on weekly topics. The use of the drawings found in comic books to represent both the experiences of patients and health care providers was suggested as a new mass medium of health communication and health literacy by an expert panel in a recent presentation at NLM. The use of comics as a medium of mass communication about health is called 'graphic medicine,' explained Patti Brennan, Ph.D., NLM's director, who moderated the discussion. Dr. Brennan announced that recent efforts by health care providers to produce print materials that depict clinical medicine and health care within a comic book genre will join NLM's existing collection of comics that explain public health issues. The panelists agreed that comics have a role in the dialogue about health care and noted graphic medicine helps explain illness from a patient's perspective and assists a physician's understanding of how illness is experienced. For example, Michael Green M.D., a professor of medicine and humanities at Pennsylvania State University, explains he uses graphic medicine publications to help medical students appreciate what is like to be a patient and to cope with a serious illness. Ellen Forney, a Seattle-based graphic medicine author, notes she initially sought to use comics as a mass medium to express her experience in coping with mood disorders. However, Forney said she soon discovered comics also were conducive to explain scientific findings about depression and mood disorders. Hence, Forney explained her recent book on mood disorders (and a forthcoming one) contain the same type of citations and clinical information found in refereed medical journals. Forney's imaginative cartoon illustration of the eight types of mood disorders (as identified by psychiatrists) are part of a traveling exhibition cleverly called 'Graphic medicine Ill-conceived & Well-drawn,' which will be hosted by NLM and 49 other health care institutions in the next four years. 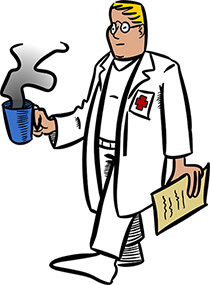 Dr. Green added graphic medicine helps some medical students and health care providers tell their own stories and yields an alternative mass medium to explain what is like to be a physician, nurse or health care provider. More specifically, Dr. Green suggested for some physicians, the medium of comics and illustration help doctors represent their inner-most thoughts and feelings about health care and provides a therapeutic and communicable emotional outlet to share these experiences with peers. Dr. Brennan noted at its best graphic medicine is literally (and we quote): 'a picture of health' (end of quote). Other panelists noted coupling art with medicine sometimes provides fresh insights about health care. All the panelists agreed with the idea (and we quote) that 'art is never done - and it stops in interesting places' (end of quote). You can see examples of NLM's new graphic medicine initiatives online at: www.nlm.nih.gov/graphicmedicine. Meanwhile, the imaginative use of mass media to convey health care and information is an example of efforts to promote health literacy. An explanation of health literacy is provided by the U.S. Centers for Disease Control and Prevention within the 'start here' section of NLM's health literacy health topic page. Links to the latest relevant journal research articles about health literacy are available in the 'journal articles' section of MedlinePlus.gov's health literacy health topic page. Links to pertinent clinical trials that may be occurring in your area also are available in the 'clinical trials' section. A written transcript of recent podcasts is available by typing 'To your health' in the search box on MedlinePlus.gov'shome page.